This is a summary of the IoT project described in my BayPiggies talk. The full slides (including additional details) are here. I built an end-to-end application which monitors the light levels in several rooms of a residence and then replays a similar pattern when the house is uncocupied. The goal is to make the house look occupied, with a lighting pattern that is different every day, but looks realistic. It accounts for the different patterns found in each individual room as well as seasonal factors (e.g. changing sunrise/sunset times). The full source code for the application is availble on github here. It makes extensive use of the AntEvents IoT framework. The application was built in three phases: 1) data capture, 2) data analysis, and 3) the lighting player. 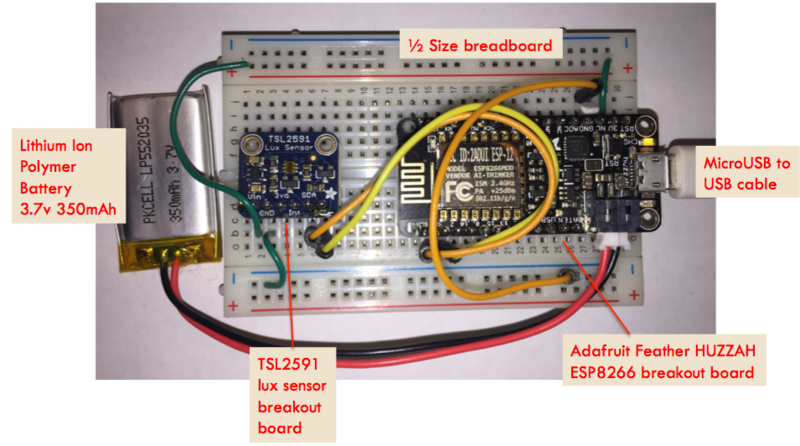 The capture subdirectory contains the code to capture and record light sensor readings. 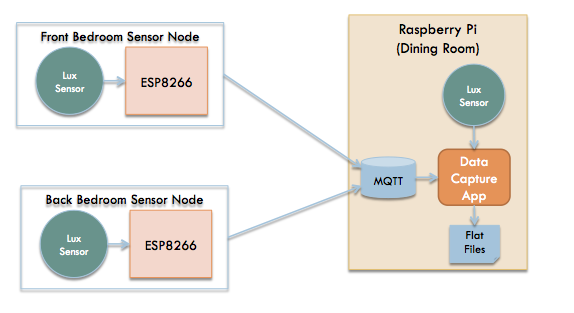 Light sensor data is gathered through two ESP8266 boards running Micropython and sent over an MQTT queue to a central server app running on a Raspberry Pi. The Raspberry Pi reads from the queue and saves the data to flat csv files. It also has a light sensor, which it samples and saves to a flat file as well. Examples of captured data from three different rooms may be found here. The light sensor data is next analyzed. 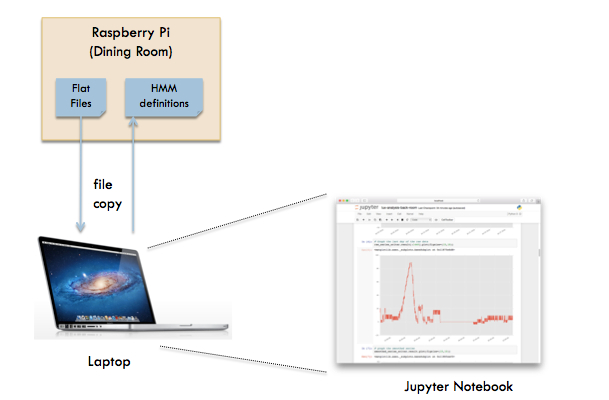 I copied the data from the Raspberry Pi to my laptop for the analysis. I used Jupyter to explore and process the light data. The analysis subdirectory contains my Jupyter notebooks (.ipynb files) analyzing the data I captured. The csv files are parsed, post-processed, and read into Pandas data structures. From there, the light readings are grouped into four levels via K-Means clustering. The four levels are then mapped to on-off values, depending on the particulars of each room (e.g. how much ambiant light is present). I divide each day into four "zones", based on the absolute time of day and sunrise/sunset times. The samples are grouped into subsequences separating them by zone and when there is a gap in the data readings. These subsequences are then used to train Hidden Markov Models using hmmlearn. Hmmlearn can infer a state machine which can emit a similar pattern of on/off samples. A total of four models are created per room, with one for each zone. 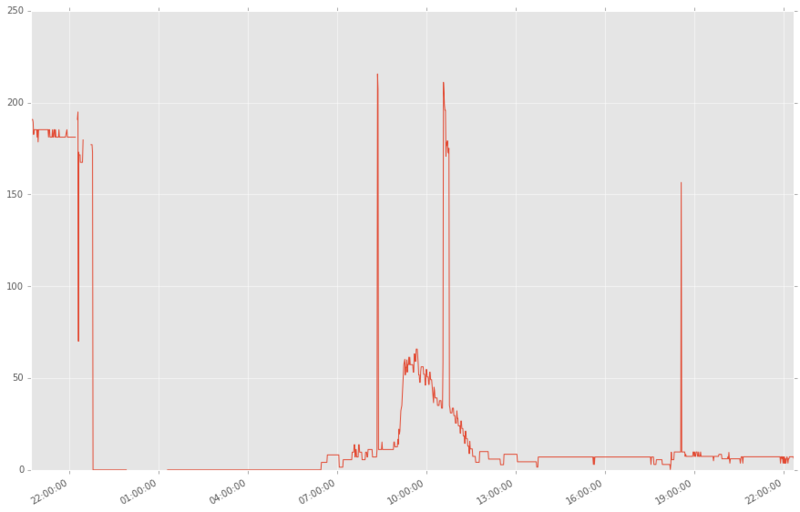 The graph below shows the light data collected from one room over 24 hours (starting in the evening and ending the following evening). Many more visualizations may be found in the Jupyter notebooks. The player subdirectory contains a light controller application which runs off the Hidden Markov Models created in the analysis phase. 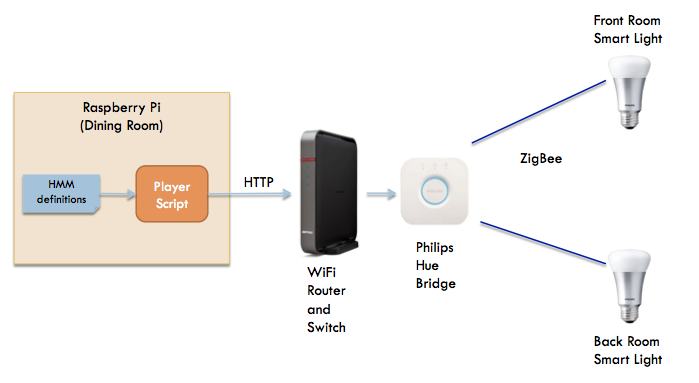 It controls Philips Hue smart lights, which are accessible via an REST api. We use the phue library to abstract the details of the control protocol.